Complies with Planning Guide for Accessibles Restrooms. Foam-padded, white, water-resistant Naugahyde seat 1 1/2 inch thick, with enclosed 1/2 inch plywood base. 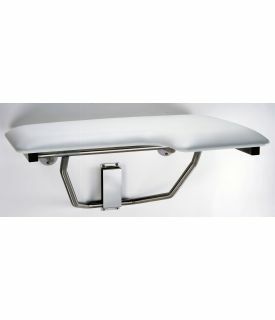 Frame and mounting brackets are type 304 stainless steel and Feature.png self-locking mechanism. Supports up to 360 lbs when properly installed. Seat 32 7/8 inch wide, projects 22 11/16 inchfrom wall. Left-hand seat. CAUTION NOTE: L-shaped folding shower seat, when properly installed and maintained, has sufficient strength to support a single user up to a maximum static load of 360 lbs (163 kg). In the interests of safety and the protection of end users, this seat should not be used to support weights exceeding 360 lbs (163 kg). Failure to abide by this warning may result in seat malfunctioning, potentially causing minor to moderste injury. TOTAL WEIGHT ON SEAT MUST NOT EXCEED 360 LBS (163 KG).